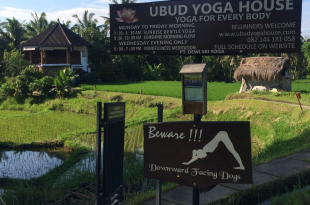 This is THE haven for all that is yoga, meditation, healing, and wellness and it is right in the center of Ubud. 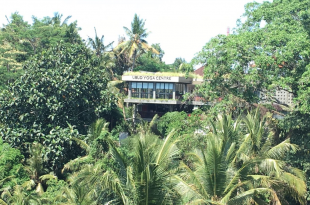 An absolute paradise for yogis, the Yoga Barn is the largest yoga studio in Bali, with 6 studios and over 100 classes to choose from every week from vinyasa flow, restorative, yin, yoga with weights, acro to sound healing meditation, ecstatic dance and even kirtan. 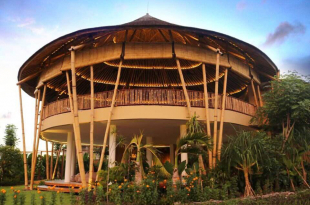 The Yoga Barn has a cleanse and detox center, juice bar, guest house accommodation and an Ayurvedic Spa (KUSH). 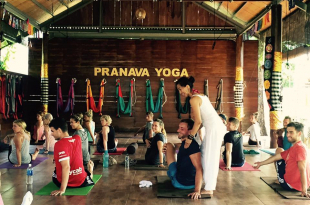 What really stood out to me was the feeling of community I had among the conscious, open minded, relaxed people visiting and working at the Yoga Barn. I felt incredibly welcome and easily made friends from all over the world at classes and at the Garden Kafe. 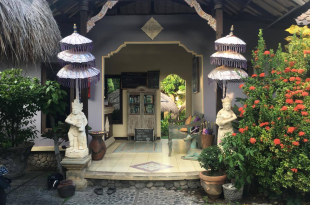 The space and Balinese architecture at the Yoga Barn is breathtaking, there are comfy chairs to lounge around with a coconut or freshly pressed juice, read a book or even sleep.. I felt very at home there! I got up early for the first class of the day, Morning Flow at 7am. We began with gentle stretches and then transitioned into a slow flowing meditative vinyasa practice, open for all levels it was the BEST start to my day! Breakfast time, 8.30am – I wandered up to the outside Garden Kafe and started chatting to other fellow yogis from my class on the big communal tables. 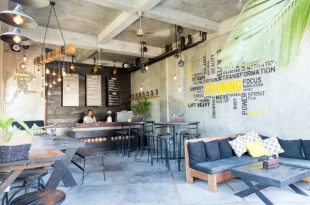 Garden Kafe is the sister restaurant to KAFE (on Jln Hanoman, Ubud) and it has SO many yummy healthy foods and juices including a wide range of vegetarian, vegan, raw, gluten-free, Ayurvedic and macrobiotic options. It really is a yogi’s food heaven! In true yogi fashion I ordered a wheatgrass shot, buuuuut then couldn’t help it and ordered the Breakfast Burrito, a Cappuccino and shared the Buckwheat Blueberry Pancakes with a new friend…SO good! I sat and lounged around the Garden Kafe for a while as everyone seems to do for hours on end, before heading to my next class - Yin Yoga at 11am with Denise. I had never done Yin before and it was harder than I anticipated! We learned the art of self-massage with tennis balls and blocks on specific meridian points in the body, but I felt so open and relaxed after… I would definitely recommend this class! I took a walk around the Yoga Barn complex to see what else there was to do apart from yoga… There is a cute little outdoor juice bar with healthy raw snacks (get the protein balls!) a brand new Cleanse and Detox Center where you can join a juice cleanse program, or make an appointment for colonic hydrotherapy sessions, massages, craniosacral, life coaching, vedic astrology readings… the list goes on. 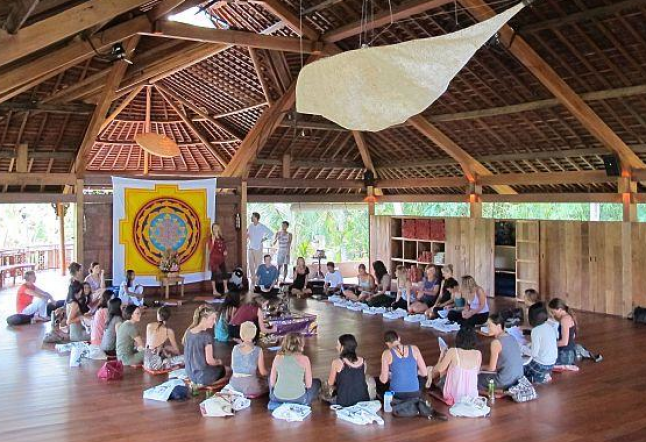 Basically if you want to detox and heal thyself… The Yoga Barn has it all. Every month there are a range of 1-day workshops to take part in with teachers from the Yoga Barn. If you wanted to delve further into a particular area of yoga like Kundalini Awakening or Handstands and Inversions, for example, check out the boards with upcoming workshops! 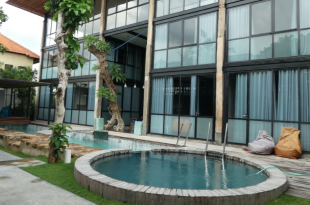 At the back of the Yoga Barn there is a large Guest House with a swimming pool for anyone wanting to be on site and really get the most out of the unlimited monthly pass! At 4pm I went to a challenging and very sweaty Vinyasa Flow Class! 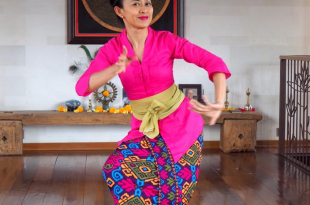 There were around 60 people in the huge upstairs studio, so there was a high, uplifting energy and I felt I had well and truly bent, lifted and twisted in positions I wasn’t even aware was possible! Continuing to float on my cloud of relaxed bliss across the Yoga Barn, in the evening I decided to go to Sound Medicine led by Shervin. I’d never done anything like that before, but taking the time to lie down and fully immerse myself in the most beautiful and relaxing timbre of instruments, I fell into a deep, blissful meditative state. Snoring is not only permitted but actually encouraged! So floated out of the studio at 9pm and headed straight home to plan what classes I’d make the next day!